Let Sorella Studio take the effort out of elegance – and leave a lasting impression on those you care for. A master chef knows a great meal must look as good as it tastes. A fine artist chooses a frame that perfectly complements the painting. And Sorella Studio presents your jewelry with an elegance that speaks of how special it is. Every custom-crafted Sorella piece is placed inside a sleek black-matte box lined in white satin. A second black-matte outer box tastefully adds strength and protection. The classic simplicity of Sorella packaging sets just the right mood and hints of the luxury of what’s inside. As an extra little touch, each piece of Sorella jewelry comes with its own polishing cloth and a handy, anti-tarnish storage bag. Personalized gift cards are available at no extra charge with any Sorella order; Chinese Symbol pieces also come with a personalized translation card. 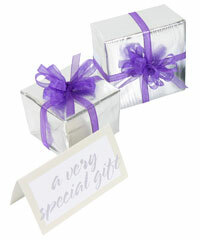 Gift wrapping with signature silver paper and a purple ribbon and bow is available for $5 per item.